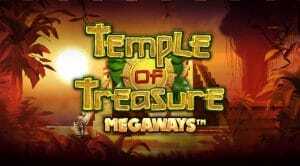 There are hidden riches waiting to be discovered in Temple of Treasure MegaWays a 6 reel video slot from Blueprint Gaming. Expect plenty of action from the symbol drop game engine which can offer up to 117,649 ways to win. Also in play are transforming symbols and a free spins round where you can vary the number of MegaWays. Those free spins also come with expanding multipliers. Play on all devices from between 10p and £100 per spin. Considering all the moving parts of the MegaWays game engine, the design here is rather good. Set against a jungle backdrop, the reels are enclosed within a stone temple. Joining the A to 9 royal values are a necklace, a gold serpent bracelet and a jewel icon. The tribal mask is the most lucrative symbol offering payouts of 50 times your bet if you land 6 on adjacent reels. Helping to create the winners is a wild. Land a winner and those symbols are removed and new ones drop in and replace them. These reactions keep on coming as long as a new winning combination is created. This is known as the Cascading Symbols feature. The number of symbols on each reel changes with each spin. It’s possible to land 7 symbols on all 6 reels. That delivers the maximum possible MegaWays of 117,649. There are a couple of other extras to consider in Temple of Treasure – first up is the Mystery Symbol feature. The golden star icon symbol has transforming properties. All examples of this that hit on the same spin morph into the same symbol and a new payout calculation follows. Free Spins feature – land 4 or more scatters on the same spin to trigger this round. You’ll then have the pick of 4 different free spins/MegaWays combinations. More than 4 scatters on the same free spin awards extra free spins. A multiplier increases with each win in the free spins round. There’s no limit to how high this can go. If you’re impatient to have a crack at the free spins round you can pay 100 times your bet and buy the feature – this is called the Temple Bonus Bet feature. Other MegaWays video slots have been a bit hit and miss on the design front. Temple of Treasure MegaWays is definitely in the hit category. It looks and sounds excellent. The gameplay delivers just what we’ve come to expect from a MegaWays title. The free spins round offers a nice variation though with the multipliers and different number of MegaWays in play. The variance is in the medium high range with top wins of 50,000 times your bet up for grabs on every spin/free spin. If you like MegaWays titles, then there’s plenty to like here. If you haven’t sampled a MegaWays slot before, then this is a pretty good place to start. I would also recommend Primal MegaWays which looks superb.